Ying Zhang, PhD, professor of biostatistics, recently received a $3 million R01 award from National Institutes of Health/National Institute of Neurological Disorders and Stroke to study statistical disease modeling and clinimetrics to prepare for preventive trials in Huntington disease. Dr. Zhang, the MPI, received the award with his collaborator at the University of Iowa, Jane Paulsen, PhD. The funding period is July 1, 2017 through June 30, 2022. Jianjun Zhang, MD, PhD, associate professor of epidemiology, recently published the paper "Associations between serum adipocytokines and glycemic control biomarkers in a rural Chinese population" in PLoS One. Dr. Zhang is the co-senior and co-corresponding author. This paper reported his collaborative research with investigators at Department of Epidemiology, School of Public Health, Ningxia Medical University and two provincial Centers for Disease Control and Prevention in China. Although experimental studies have shown that adiponectin and leptin modulate glucose tolerance and insulin resistance, it remains unclear whether these adipocytokines exert similar effects in general human populations. This study suggests that adiponectin and leptin play a role in the development of insulin resistance and diabetes independent of metabolic syndrome in a rural population in North China. Dr. Zhang also published the paper "Association between urinary phytoestrogens and C-reactive protein in the continuous National Health and Nutrition Examination Survey" in the Journal of the American College of Nutrition. Dr. Zhang is the senior and corresponding author, and the first author (Michael Reger) is his former PhD student. A reduced risk of some cancers and cardiovascular disease associated with phytoestrogen intake may be mediated through its effect on serum C-reactive protein (CRP; an inﬂammation biomarker). This study revealed that urinary total and individual phytoestrogens were signiﬁcantly inversely associated with serum CRP in a nationally representative sample of the U.S. population. For an accessible version of the paper below, please contact the publisher. Brian Dixon, PhD, MPA, FHIMSS, associate professor of epidemiology, authors new publication on clinical decision support reminders to improve HPV vaccination. Along with Monica Kasting, PhD, Fairbanks alumna, and others, Dr. Dixon published a new article in BMC Medical Informatics & Decision-Making that examines physician perceptions of a clinical decision support (CDS) reminder aimed at improving the rate of HPV vaccination among adolescents. Interviews with healthcare providers revealed that while many recalled seeing the CDS reminders, few of them perceived the reminders as effective in changing their behavior when it comes to HPV vaccination. Yet the study data showed increasing rates of vaccination during the study period. 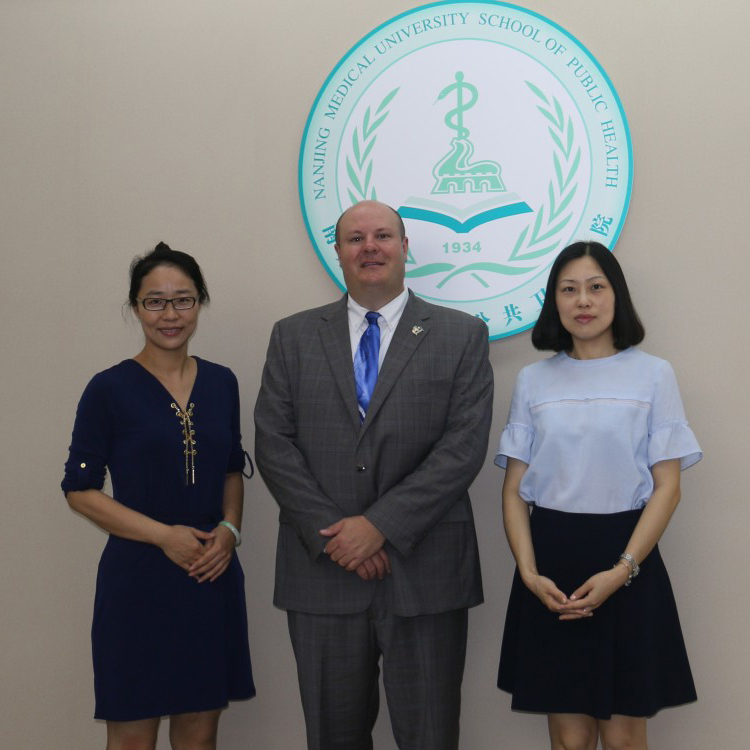 While in China for the 16th World Congress on Biomedical and Health Informatics, Brian Dixon, PhD, MPA, FHIMSS, associate professor of epidemiology, visited with the faculty at Nanjing Medical University's School of Public Health. This school of public health is ranked 3rd in China and has an existing agreement with Fairbanks School of Public Health for a dual degree of MBBS and MPH. Dr. Dixon was warmly greeted by Professor Gu Aihua, the Associate Dean, and Associate Professor Sijun Liu, who serves as the Director of the International MPH program at NMU. With the group, Dr. Dixon discussed the invitation extended by NMU to teach a course as a component of the new International MPH program, which has its first cohort starting at the school this fall. The trip helped to further strengthen the relationship between FSPH and NMU. Dr. Brian Dixon visiting Nanjing Medical University's School of Public Health. Joint Biostatistics Seminar: Dr. Robert Todd Krafty Will Present "Conditional Adaptive Spectral Analysis of Nonstationary Biomedical Time Series"
Robert Todd Krafty, PhD, associate professor of biostatistics, Pittsburgh University, will present "Conditional Adaptive Spectral Analysis of Nonstationary Biomedical Time Series" on Friday, August 25, from 1:00 to 2:00pm in HITS 1110. Many studies of biomedical time series signals aim to measure the association between frequency-domain properties of time series and clinical and behavioral covariates. However, the time-varying dynamics of these associations are largely ignored due to a lack of methods that can assess the changing nature of the relationship through time. Dr. Krafty's research introduces a method for the simultaneous and automatic analysis of the association between the time-varying power spectrum and covariates, which we refer to as conditional adaptive Bayesian spectrum analysis (CABS). The procedure adaptively partitions the grid of time and covariate values into an unknown number of approximately stationary blocks and nonparametrically estimates local spectra within blocks through penalized splines. CABS is formulated in a fully Bayesian framework, in which the number and locations of partition points are random, and fit using reversible jump Markov chain Monte Carlo techniques. Estimation and inference averaged over the distribution of partitions allows for the accurate analysis of spectra with both smooth and abrupt changes. The proposed methodology is motivated by and used to analyze the association between the time-varying spectrum of heart rate variability (HRV) and self-reported sleep quality in a study of older adults serving as the primary caregiver for their ill spouse.